The prestigious National High School Invitational (NHSI) begins this week at the USA Baseball National Training Complex in Cary, N.C. and will feature a pair of Georgia High School teams in South Forsyth and Blessed Trinity. The eighth annual event will be played April 3-6. "USA Baseball is honored to once again shine the spotlight on high school baseball with the eighth annual National High School Invitational," USA Baseball Executive Director/CEO Paul Seiler said on the organization's website. "This event continues to draw elite high school baseball programs, as well as some of the top talent from across the United States, for a truly one-of-a-kind high school baseball experience. We look forward to welcoming these sixteen programs to the National Training Complex in April." The 16-team tournament will feature four teams from California as well as three from Florida, including national power IMG Academy who claimed the Blue division title at the prestigious Perfect Game Showdown in early March. California teams have dominated the NHSI, winning six of the seven titles since the tournament began in 2012. Some of the past teams from Georgia to participate in the NHSI include Walton, Grayson and Allatoona. SOME THINGS NEVER CHANGE: When Cartersville and Troup meet in Region 5-4A play, the two teams usually produce some of the best baseball in this state. The two region rivals split a pair of games last week. In a 4-1 Troup victory on March 27, the Tigers' Jackson Knox outdueled Cartersville's Mason Barnett. Troup scored three runs in the bottom of the sixth to break a 1-all tie. Knox struck out eight in the complete-game win and his run was unearned. Colton Webb went 2-for-3 to lead the Tigers at the plate, while Colby Williams finished 1-for-3 with a pair of RBIs. But Cartersville got even on March 29. In the bottom of the 10th inning, Josh Davis' walk-off single helped Cartersville to a 2-1 victory and helped Gage Morris earned the victory in relief. Starting pitchers Williams and Cartersville's Logan Martin each got no-decisions after both went seven innings. NORTH PAULDING STAYS STRONG: North Paulding took two of three from North Cobb in a key Region 3-7A series. TJ Worley and Mitchell Heer had two hits each, while Mikade Johnson added a solo homer to help pitcher Zach Maxwell earn the victory in a 4-1 win on March 26. Maxwell struck out 13 and allowed just one unearned run on one hit in 5 2/3 innings. In a 2-1 victory on March 27, Heer earned the victory and Tyler Roon the save as the Wolfpack got a 2-for-2 performance from Cole Dunn. However, North Cobb junior Nathan Williams allowed just one run on six hits to help the Warriors to a 6-1 win on March 29. Thomas Chandler went 3-for-4, while Jake Mantooth collected two hits to lead North Cobb. NORTH GWINNETT TAKES TWO OF THREE: North Gwinnett took two of three from Mountain View to take over first in the Region 6-7A standings. The Bulldogs defeated Mountain View 6-0 on March 26. Parker Waggoner went 3-for-3, while Brian Leimkuehler and Josh Shuler collected two hits apiece to help pitcher Brandt Pancer outduel Mountain View ace Gavin Collyer. Mountain View took a 5-4 victory on March 27 behind Kenny Mallory's three-run homer and Jonathan Acosta's 2-for-3 performance. However, North Gwinnett took the rubber game, a five-inning 13-2 victory, on March 29. Cameron Speicher earned the victory, allowing just two runs on four hits. Meanwhile, Michael Borah, Leimkuehler and Corey Collins each had two hits. HOUSTON SWEEPS VALDOSTA: Houston County swept a pair of one-run games against Valdosta in a key Region 1-6A series on March 29. The Bears won the first game of the doubleheader 4-3, then took the nightcap 8-7. Cameron Jones went 2-for-3 at the plate, while Chandler Dawson earned the victory in relief. Starter Jaden Woods and Dawson combined to allow Valdosta just four hits. The Bears then got two hits each from Jacob Profit, Coleman Willis and Jeremy White to help Houston sweep the two games. Corbet Luna's triple scored a pair of runs to help Willis earn the victory in relief. Colby Thomas went 3-for-4 with two doubles and two RBIs to lead Valdosta. Cory McCann and Lamonte Lindon finished with two hits. SAVANNAH CHRISTIAN ON A ROLL: Garrett Bradley and Joey White combined to allow just two runs on two hits as Savannah Christian defeated Johnson County in a key Region 3-1A matchup on March 29. It was the eighth straight win for Savannah Christian, who is 18-4 overall and ranked No. 2 in the Class 1A Private School poll. Kyle Hilton and Jarrett Brown each had two hits to lead the Raiders at the plate. Brown had a triple and two RBIs. Brett Caneega finished 3-for-4 with a triple and an RBI in a losing cause for Johnson County, who is ranked No. 4 in the Class 1A Public School poll. WESLEYAN MAKING A STATEMENT: Wesleyan has won six straight and is tied for first place in the Region 5-1A standings with undefeated Mount Vernon Presbyterian. The Wolves topped Trinity Christian on March 26 in a key region contest. Despite managing just four hits (none for extra bases), the Wolves improved to 14-4. Charlie Daniel, Don Taylor, Cooper Blauser and Druw Jones all had RBIs in the game. Pitcher Wyatt Copeland struck out 14 and allowed just one earned run on five hits in a complete-game victory. HARLEM TAKES CONTROL IN REGION 4-2A: With region play in Region 4-2A nearly complete, Harlem has taken firm control over first-place in the region standings. The Bulldogs defeated Westside-Augusta 7-3 on March 29. It was the second time this season that Harlem, ranked fourth in Class 2A, has defeated Westside. Mason Spivey went 3-for-4 on offense and was the winning pitcher. Colton Lopez, Malik Frails and Chase Flick had two hits each to lead Harlem. Owen Powell (RBI double) and Brison Creech had Westside's only two hits in the game. 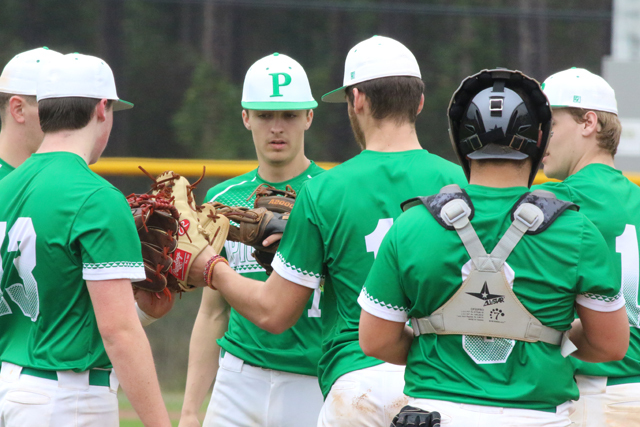 BLESSED TRINITY ROLLING: Blessed Trinity took over first-place in the Region 7-4A standings last week with a pair of victories over Flowery Branch and one over White County. The Titans pounded Flowery Branch 14-4 on March 27 behind an 11-hit performance. Brett Buurseema went 3-for-3, while Jake Smith, CJ Abrams and DJ Radtke each finished with two hits, Smith had a double, a homer and four RBIs. The Titans then downed Flowery Branch 6-2 on March 29. Pitcher Eric Moore allowed just two runs on four hits to earn the complete-game victory. Abrams, Steele Chambers and Ryan Davis all had two hits each. ETC., ETC. : Irwin County managed just two hits, but they made the most of them in a 2-1 victory over Charlton County on March 29 in a key Region 2-1A contest. Pitcher Zach Smith allowed just an unearned run on three hits to pick up the complete-game victory. ... Keep an eye on Seminole County in Class 1A. The Indians beat Pelham and scored a big nonregion victory over Clinch County on March 30. The Indians have won 11 straight. ... Vidalia took two of three from Bacon County to move back into the Class 2A rankings this week. Vidalia will meet cross-county rival Toombs County in a huge Region 2-2A contest this week that will have playoff implications. ... Social Circle swept Banks County last week in Region 8-2A and created a tie for first-place in the region standings between Banks, Social Circle and Elbert County. ... Bremen holds a two-game lead over Callaway and the tie-breaker in the Region 5-2A standings. The Blue Devils, the No. 1 team in Class 2A, can win the region with a victory in their three-game set with Temple that begins on April 9. ... Harris County defeated Veterans twice in Region 1-5A play on March 29. The Tigers need just one win over Thomas County Central on April 12 to capture the region title. North Forsyth scored a pair of wins over West Forsyth and defeated South Forsyth last week. On offense, Carter Mullikin combined to go 8-for-10 with a double, a homer and five RBIs. Garrett Staton combined to go 7-for-11 with three doubles and five RBIs. On the mound, Anthony DiMola hurled a one-hit shutout in a 2-0 victory over South Forsyth on March 26. He struck out seven. Brody Westbrooks allowed one run on two hits and struck out six in a 10-1 victory over West Forsyth on March 29. Cole Munhall earned a victory in relief in a 13-7 victory over West Forsyth on March 29. He allowed one unearned run on two hits and struck out three in four innings of relief. North Forsyth is 13-7 on the season. Parkview improved to 19-2 on the season after winning five games last week. The Panthers defeated Berkmar, Meadowcreek twice, Buford and Marist. Offensively, Allan Del Castillo combined to go 8-for-11 with two doubles, two homers, 10 runs and 11 RBIs. Jonathan French combined to go 8-for-13 with two doubles, two triples, two homers, eight RBIs and eight runs scored. Mauri Miller combined to go 8-for-10 with a double, four RBIs and six runs. Pitcher Miles Garrett earned the victory against Buford, allowing one earned run on four hits and striking out five in 4 1/3 innings. Xander Stephens earned the victory on the mound, allowing three hits and striking out eight in five innings. He allowed no earned runs. Cameron Orr earned a victory against Meadowbrook and a save against Buford. In 3 1/3 innings, he allowed no runs, no hits and struck out 10. Woodstock took two of three games from cross-county rival Etowah in a key three-game set in Region 4-7A play. Etowah won the first game on March 26, but Woodstock won a doubleheader on March 28 with a pair of one-run victories. Senior pitcher Josiah Siegel allowed just one earned run on six hits to pick up the complete-game 4-3 victory in the first game of the doubleheader on March 28. He struck out nine. Logan McMunn's bases-clearing double in the sixth inning gave the Wolverines the lead for good. The final game of the series, a 7-6 Woodstock victory, went back-and-forth with Christian Preiser's two-run double in the sixth that gave the Wolverines a 6-5 lead. Brennan Milone worked out of a jam in the sixth by inducing a line drive to end the threat. In the seventh, he stranded the tying run on third base with a fly out to end the game. Milone and Spencer Keefe homered in the series. Woodstock is 13-7 on the season. Thomas County Central is 19-1 on the season. The Yellow Jackets defeated Lowndes, Deerfield Beach (Fla.) and Bainbridge twice. Zach Fletcher led the offense, going a combined 7-for-12 at the plate and scoring five runs. Slade Taylor had five hits, including two doubles during the week, to drive in runs. Pace Mercer combined to pitch eight innings, fanning 10 and earning a victory. RJ Delaney no-hit Bainbridge on March 29 to improve to 7-0 on the season. Shane Stephenson earned a victory on the mound against Deerfield Beach and a save against Lowndes. In two innings of work, he allowed no hits and struck out three. Westover went 2-1 last week, including victories over Dougherty and Carver-Columbu. La'Borris Buchanan went a combined 7-for-8 in the three games. He scored five runs, had three RBIs and stole eight bases. Rodney Bullard batted .500 on the week, scored six runs and stole 14 bases. Daymon Polite batted .444 during the week, finishing with four RBIs, nine stolen bases and an inside-the-ark home run. East Jackson swept Franklin County last week in Region 8-3A play. It was the Eagles' first series win in school history. In a 1-0 win on March 26, junior pitcher Halton Hardy allowed just one hit and struck out five in the complete-game victory. Junior Cole Sealey scored the only run on a balk in the seventh inning. In the second game of the series, junior Josh Compton struck out four and allowed four runs on six hits to earn the victory on the mound. Sealey earned the save, allowing no hits in two innings. Caleb Adair went 4-for-4 with two doubles and two RBIs. Compton went 2-for-2 with an RBI, while Josiah Stansell went 2-for-4 and scored three runs. In the third and final game of the series, Adair earned the victory and Hardy earned the save. Hardy struck out seven in three innings. Adair went 3-for-3 with a double, two RBIs and scored two runs. East Jackson is 9-8 on the season. Ringgold improved to 16-4 on the season with a pair of victories over Lakeview-Fort Oglethorpe and Adairsville last week. In a 15-0 rout of Adairsville, Sam Mills had a grand slam and a three-run homer in the same inning. Other strong offensive performances included Andre Tarver (2-for-3), Daulton Schley (2-for-5, 4 RBIs) and Wyatt Tennant, who went a combined 3-for-6. On the mound, Holden Tucker hurled a one-hit, complete-game shutout in a 3-0 victory over Lakeview Fort-Oglethorpe. he struck out nine. Saint Francis defeated Mount Bethel Christian twice and Whitefield Academy last week. Senior shortstop Griffin Weaver had a grand slam and finished with five RBIs in a victory over Whitefield Academy. Pitcher Will Clark struck out 13 and won his fifth game of the season against Whitefield Academy. In the second game against Mount Bethel, first baseman Kyle Bork and catcher Bret Madren combined for five hits (two doubles, home run each) and eight RBIs. Senior outfielder Brooks Mitchell had five hits (three doubles, one triple) and a combined seven RBIs in the three games. Saint Francis is 15-4.